One in 45 children experience homelessness in America each year. That’s over 1.6 million children. 42% of children in homeless families are under age six. There is evidence that homeless children have more health problems, hospitalizations, and developmental delays than poor children who have never been homeless. A number of LAMP Missionaries are going out two by two, visiting shelters for homeless families around the city, bringing them the compassionate love of Jesus. The LAMP Missionaries share the love of Jesus through reading the Scriptures with and praying with those caught in the web of homelessness. 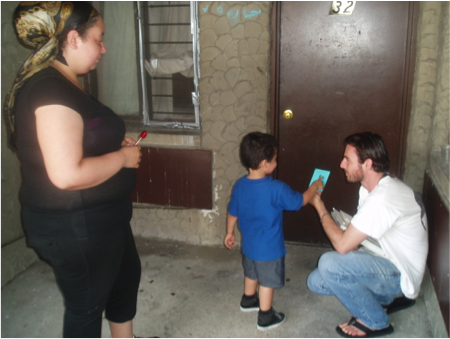 Two LAMP Missionaries knock on the door of a “motel” that is now housing homeless families. A LAMP Missionary visits with a woman living in a shelter. After listening to her plight, she invites the woman to visit the local parish to pray before the Blessed Sacrament.